Southwestern High School started competing at the National High School Cheerleading Championship back in the early 2000s with the hopes of making a name for themselves in cheerleading. Like any program, the journey to the top is challenging and filled with ups and downs but on this day six years ago, Southwestern High School made history winning their first ever UCA Small Varsity National Championship. Since that memorable day in 2013, the program has been a must-watch team in the competitive division. The Warriors took a short hiatus from the division last season, but they are back this weekend and stronger than ever. After a zero-deduction routine in Prelims on Friday, Southwestern advanced straight through to Finals! 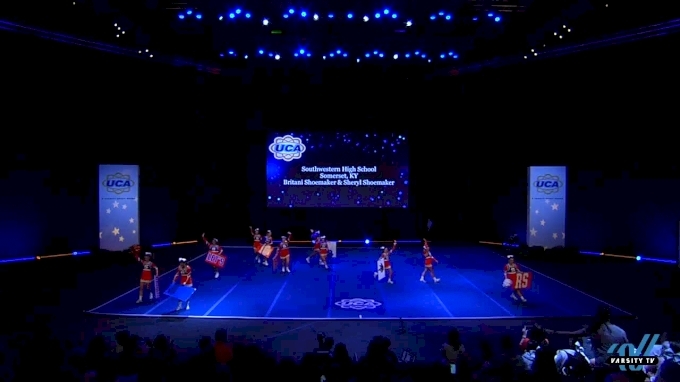 The Somerset, Kentucky team now holds two UCA Small Varsity Dll National Championship titles and they are looking to grow their legacy even more with another solid routine in Finals. More than 100 of the nation’s best high school teams started out the weekend in the Small Varsity Divisions but only 34 remain this morning in Finals. With a max of only 12 athletes on the mat, there is no room for error in such a competitive division. To be able to compete amongst so much talent is a humbling honor for all of the Finalists. Tune in to cheer on the Warriors today in Small Varsity Dll Finals at 11:20 AM ET in the HP Field House!